The following is a guest post by Trevor Owens, Digital Archivist with the Office of Strategic Initiatives. For my first post, I wanted to introduce readers to Recollection, a free and open tool NDIIPP is working on. 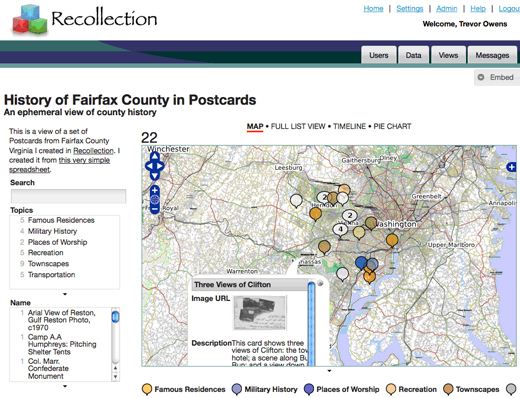 Recollection is a free, open source platform that lets archivists, librarians, scholars and curators create easy to navigate web interfaces (like maps, timelines, facets, tag clouds) to their digital, cultural heritage collections. If you think Recollection might be useful to your organization, we encourage you to take a minute to request an account for the beta version of this software. A recent article in Fast Company provides an excellent overview of the Recollection software, and I encourage interested readers to check out that post. The goal for this post is to show a little bit of what Recollection can let you do for an individual collection. For my illustration, I will use the example of a collection of historical postcards. The Recollection workflow starts with importing data about the collection. For this example I will start with a spreadsheet of information about a collection of digitized postcards. Recollection can import other kinds of data, but spreadsheets work great as examples. The screenshot of the spreadsheet in Example 1 gives a sense of what we are starting from. Each row includes information about the individual cards, and each column contains specific information and links related to those cards. When you are logged in to Recollection you can click the upload data button to select and upload the data. Once you've imported your data, Recollection will prompt you to describe that data using the intuitive interface seen below. By setting the drop-down menu for the Image URL to "image," Recollection knows to display that link as an image. 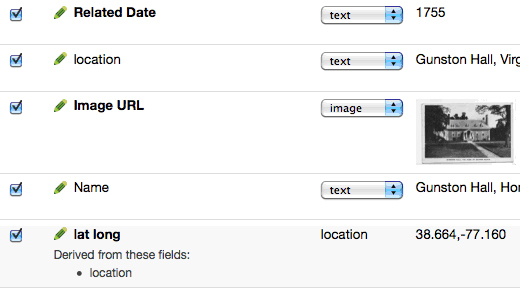 At the bottom of the screenshot, in Example 2, you can see a field called "lat long." This field is derived from the location field. Recollection has the ability to lookup points of latitude and longitude to provide standardized geographic information and display these postcards on an interactive map. Once you have described the data from your collection, you can start building the map interface to that collection. For example, the screenshot below in Example 3 shows the map interface I created for the collection of postcards. I'll give you a quick tour of the map part of this interface and highlight where some of the information came from in the original spreadsheet. You can explore the list, timeline, and chart view live on the website. Each of the pins on the map is associated with the locations Recollection was able to look-up. I was even able to color-code the location pins based on the categories from the spreadsheet. The bottom of the map displays the custom legend. Example 3 demonstrates what happens when I've clicked on the pin for the "Three Views of Clifton" card. This pulled up a thumbnail image of the postcard along with other information I chose to display. On the left side of the screenshot, you can see a search box, a list of topics and the names of the cards. New users will find themselves quickly becoming fluent with Recollection. Whether you are displaying historic photos or prized possessions in your gallery, Recollection allows you to maximize the public's access to your collections of cherished cultural heritage items.